I think this is going viral right now. I actually think the moving, light coloured and transparent-ish figure was created due to the light reflecting against something that's moving above, like hanging toy with very reflective bits on, circling in the above air, causing the effect like a mirror ball. The reflecting light can be due to a small LED light on the baby monitor I suspect?? "A UFO is sighted somewhere in the world every six minutes. But there could be even more seen, with many sightings and experiences going unreported, according to close encounter therapist Mary Rodwell. She never strongly believed in extraterrestrial life herself, but when a family experiencing paranormal activity came to her some 20 years ago, they changed her convictions. Ms Rodwell has now counselled more than 3000 people who claim to have been abducted and said the stories she has been told have many commonalities. “People experience the same anomalies, they wake in the morning after having a strange night and feel like they were taken somewhere else,” she said. 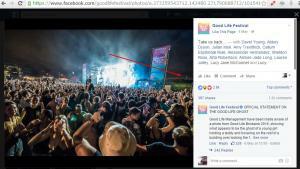 Ms Rodwell, Australian Close Encounter Resource Network director, said these experiences had nothing to do with believers. 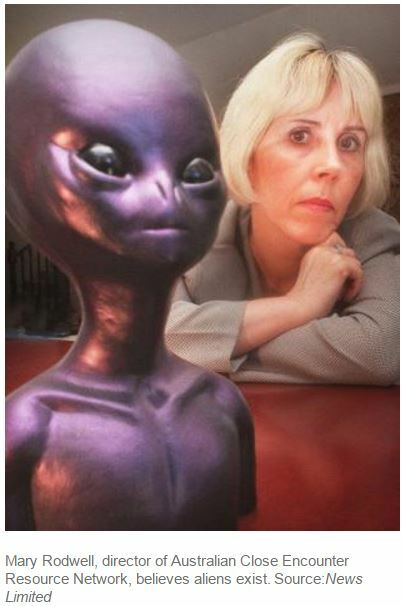 “It often happens to people who have no interest in UFOs or aliens and my clients are anybody from lawyers, doctors, nurses to pilots, police, housewives and children,” she said. One of Ms Rodwell’s practises is hypnosis, for people to discover “missing time”. Missing time is when you move from one point to another, with no recollection of how you got there. After 20 years of studying extraterrestrial life, Ms Rodwell said she had come to understand how common experiences are. “People need to come out of the space closet,” she said. With FBI special agents Fox Mulder and Dana Scully re-hitting our television screens in the new series of The X-Files, we divulge some of Australia’s scariest and most unbelievable abduction reports. That was one of the last things 20-year-old pilot Frederick Valentich said before disappearing into thin air, with no trace of oil or metal on land or in sea. The 1993 abduction of Kelly Cahill was actually mentioned on the first new episode of The X-Files. Ms Cahill was driving home with her husband in Dandenong, Victoria, when a craft flew overhead. She claims they lost an hour of time and she was rushed to hospital with stomach pains after discovering a small triangle abrasion on her body. Extraterrestrial life experts say the Knowles family case is one of the most significant close encounters in history. Faye Knowles was heading to Perth along the Nullarbor Plain in January 1998. She was with her three sons Patrick, 24, Sean, 21, and Wayne, 18. When there was a death occurred in a property, the owner is required to disclose the incident to the renter who would be renting immediately after the incident. But in order to stop the rent falling due to the bad news, some owners use Salvaging mediator companies to a professionaly employed someone to stay in the property for 1 month. Just to be able to avoid disclosing the record. Once that month passes, the owner is no longer required to disclose what really happened in the place to any other renters in future. That's a normal case for the properties with murder, suicide, death from old age, food/water deprivation (yeah it happens), ill health, etc. ...BUT there are far worse cases. There are properties where keep on RECALLING SALVAGES. Apparently 3~4 years, that was the trend of that horror house. I think I posted about The Ranch in Japan before, but as I found some real footages you can check out the location, I thought I archive them here again. Sorry, all the vid links are No Subbed. I'm sure some of you went ping as soon as you heard the word "Ranch" but yeah, that's exactly the point. The location is considered to be a UFO hot spot, and MIB appearance was reported. The place is absolutely weird in many ways. To start with, no one can figure out who owns the place. The contact #s etc got found as not existing. Once there was this smell of cows reported by all tv crews at a shooting, though there were no cows there or near by. Also deep low humming noise was reported from behind the site continuously, but everyone knows that there's NO ELECTRICITY is connected there. ...All these bits of dots sound veeeery familiar to us, who have been studying lots of UFO hot spot Ranches to the Underground Alien Bases. Maybe some aliens require lots of cows to process, as we already heard from other countries' abductees reporting the aliens were using cow's body fluid a lot. This quite inaccessible, "why-the-hell it's existing" ranch has been one of the most famous story talked among Japanese UFO researchers. And there was a huge rock found in the middle of the administration building, which was the first thing you saw as you open the door to get into the building; it was clearly honoured by someone as it was wrapped by special Shinto rope around it to mark its specialty. The thing was...the rock was way too big to fit through the door way, which makes the building was built around the rock to encase it. In 2011 footage, the huge rock was removed from the office floor, and looked like it was rolled off the cliff, as one of the crew members found it on the mid way down the cliff. OR....that place is a very special place and possibly a merging point of time and space, and what some peeps experienced as smell of cows might had been existed in the past in another timeline, or different parallel reality? Whatever it is....it's an insane place. This series of investigation reported wacky stuff happening to them, and entire people visiting the site that are 9 people all smelled cow smells. The site didn't have cows for ages. But the smell of them waffle through the space around them, making them totally puzzled. 2: Inside the Admin premises at Night just at the beginning. The weirdness of the story is that this Ranch buildings have been altered so many times. The buildings existing there were using brand new steel frames back in 1981. No dust, no cows then. Since that time, numerous investigators went there over the past 30 years, and in the vid 1 of #2 pile, the latest of the building alteration was shown. In the vid below captured the window, which was the only access point to get into the 2nd floor that didn't have any staircase to get up in 1981, was covered up in the above link by veneer boards, but in the vid below, you can see the former state---before the window got covered up when the guys went back there in 2011. And the trophies showing good grades of their cows were all dusty and rotting on the admin office floor. The guy who actually found the location in the first place said that there used to be a large room filled with many glass beakers and other scientific equipments were scattering about. In 2011, there is no more scientific equipments anywhere in that location. Low humming noise from underground though there's no electricity coming to the place on surface. DECADES-OLD MYSTERY: IS THIS WOMAN CAPTURING OTHER DIMENSIONS ON FILM? we supposedly were more green and is it because we had more chlorophyll in our veins ? Can you see Duff's (the guy in the middle) foot being missing...?? It's not missing, it's a camera colour displacement (like the green screen). When the clothing/boot has a certain colour it takes over the colour of the rear and turns like "invisible". Ohhhhhhhhhhhhhh thanks heaps for the explanation, Neo!! Woooooow footages of Orbs there!! Fascinating!! I have nooooooooooo idea what the hell it is...but surely it was interesting to watch. I dunno wth it was but it was there by the look of it. That's what counts the most for me. "Pupils and staff believe they had seen spirits or had supernatural experiences and began behaving oddly after claiming they had seen a figure dressed in black. Authorities shut the school after the outbreak and called in Islamic traditional experts, scholars and even witch doctors to perform prayer sessions and ‘exorcisms’." The vid is of a Japanese MSM tv show from 1990's. There's a guy called Tsurutaro Ayanokoji, who managed a "Show Pub" (=live entertainment bar) in Nagano prefecture called the "Police '90". No English subs, but I think you can just watch and see how much his power is effective. Goes for about 15 minutes. He was sick of proving it being ESP. Instead of arguing about it, he decided to do it in front of tv cameras to shut everyone up. 18-10 stainless steel folks and spoons were used to try bending them. Anyone can forcefully bend those, if they aim forcefully. But when it becomes double twists, and incredibly, FIXING ALL BENT SPOONS AND FOLKS as LIVE on stage, that was one of the best proof of psychic power someone had shown in front of tv crew in public. The skeptics had to say there was no trick applied on his doing in the show. I'm sure you have heard about this picture? 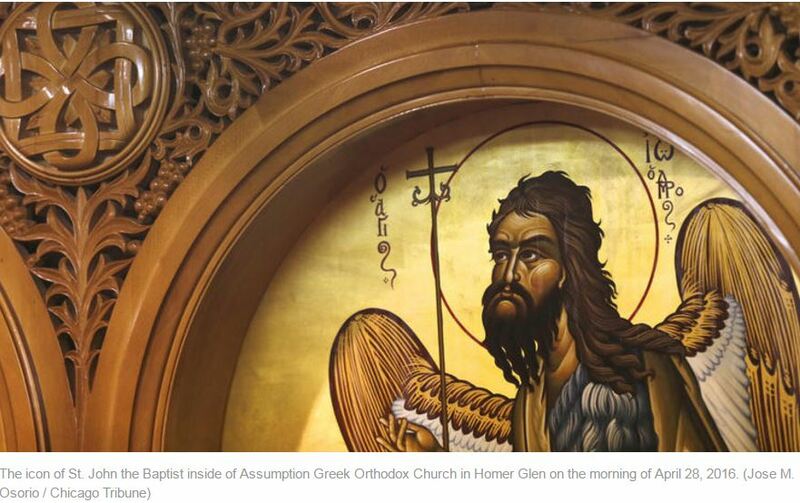 "As millions of Orthodox Christians around the world prepare to celebrate Easter this Sunday and the miracle of Jesus Christ's resurrection, thousands across the Chicago area are flocking to a southwest suburban parish to see what they believe to be a different miracle. 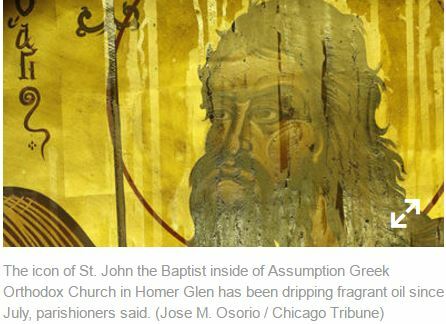 Since July, tiny droplets of fragrant oil have trickled down an icon of St. John the Baptist in front of the altar at Assumption Greek Orthodox Church in Homer Glen. Parishioners believe the oil has healing properties and that its origins are a blessing from God. "The first thing out of my mouth was 'What do I do?' " said the Rev. Sotirios "Sam" Dimitriou, the parish priest. "You don't expect anything like this. It's breathtaking. It's so powerful to see such an act of God before your eyes." Whether it's an act of God or a chemical reaction, no one really knows. And frankly, few in the Greek Orthodox community care. A rational explanation is irrelevant if what seems to be a supernatural event draws people toward God, clergy say." This was a good read IMHO. There are lots more of weird stuff happened for bands. This is for the archiving of EVP. A clear EVP appeared on LIVE tv show in Japan. I'm not sure what year it was in but within the last 2 decades, to be safe. "Chigai-Masu..." spoken in a female voice. Not ALL audience heard of the voice, but ALL people on the stage, and a lot of people from the audience definitely heard the voice. The MC got very intrigued, asked the staff to replay the vtr on the spot (demanded about it full on and made it happen there on), and they did a lot of analysis on the sound source. 1 mic in the audience, 2 mics from the peeps on the panel picked up the voice. Weird thing is that ALL THESE MICS WERE SEPARATED WITH FAIR BIT OF DISTANCE, WHILE THERE WERE MANY OTHER MICS IN BETWEEN, BUT THOSE OTHER MICS NEVER PICKED UP THAT VOICE. The phrase of the ghostly EVP means "No, it's not." To start with, the people on the stage were talking about the Japanese version of Ouija board. And it's called "Kokkuri-San", meaning "the animal spirits", which are known to be reckless, and unable to tame. Why the hell people still do such incantations, even you know you are risking yourselves with? ...Ummmmmmmm, I think people still wanted to hear the predictions. The same thing as why people do Ouija. But this Kokkuri-san calls up human ghosts as well. The panelists were talking that "Kokkuri-san" calls up bad Fox spirits, and they were saying yeah on that. Then suddenly straight after that mentioned, that weird but clear EVP happened, TO NEGATE WHAT'S BEEN COMMENTED re: how the Kokkuri-san works. Archiving post but give you the juiciest bits for you! They said...the decent cops often end up seeing lots ghosts because they always attend "horrible incidents". Case 1: Upon arrival to the spot of murder, just outside of the house, the cop saw a fire-ball, which in Japanese culture is believed as a representation of someone's spirit, appearing on the ledge under the balcony of the 2nd floor. Wondering wth was that all about, as the cop went to look outside from the same balcony, he discovered the foot prints of the murderer. Those foot prints directly led to the man and they caught him successfully. Case 2: Often seeing the spirits at the car/motorbike accident sites, presenting exact clothing being worn at the time of their deaths. A cop received a call from a 57 yo man. The guy was freaking out about a Ghost encounter. So the cop went to see him. The guy said that he received a piece of cake from a neighbour, and old lady. She was telling him "thank you for the apples you kindly passed to our family the other day-here's my return to your kindness" and gave him the cake on a small plate. He took it back inside the home after saying thank you and good bye to the old lady. His wife inside the house freaked out and told him that the lady had passed away some days ago! He then went and visit to that house, taking the cake with the plate in his hand. The lady of the house said they bought the exact cake, 4 pieces, ate 3 but left 1 for the old lady who died. They went in to look for that plate. Both homes refused to take the cake, the poor cop ended up taking it with him back to the Police station. At mid night, he got hungry and ate the cake. ROFL. 4: Almost ALL the 1st division Police force (who attend murder cases etc) have a CD of Monks Praying in their cars....they do encounter a lot of bodies, and this particular cop dealt with more than 1000 bodies, saw enough of weird stuff happening around them. A decent analysis on The Warrens' cases. To me, this is the manner we need to retain to look into any paranormal cases, and even after retaining that skeptic attitude and still getting physical evidences, then we all can go Woooooooooooooooooooooow......and we really can present it to the rest of the world saying "Hey, we got the proof!" Having good records of credibility, ethics and having chunky background knowledge are very important to be an investigator, apart from actually hitting the target and getting some concrete evidences. Apparently in Bangladesh, male ghosts are classified as Jinn, and female ghosts are called Holi. I happened to hear that comment while a Bengali man was saying it in a Japanese sentence...so I tried to confirm what I heard....but when I tried to follow up on the term "Holi", did I ever come across to anything close to that sound!?? Now I'm wondering if he was using a term used in his local area, not the national term as such.